Somewhere over the course of the last year I received this little fresh perfume bottle in a swag bag and I’m sad to say it’s on its last legs. Almost empty. Only little tiny droplets left. I’m pretty particular with my perfume choices. 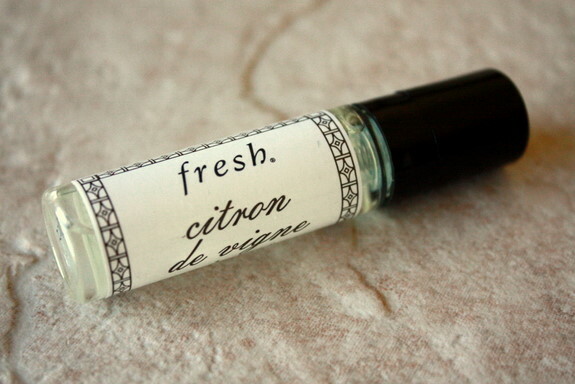 Between allergies and migraines, the perfume I wear has to be a really specific blend of specialness to make the cut and I’m happy to say this fresh Citron De Vigne is marvelous. It’s exactly what it professes to be: fresh and nicely citrus smelling, and if I had more of it I’d probably bathe in it. Have any of you tried any other fresh products? I’m really curious if the rest of the line is as lovely as this stuff. yummmm sugar lip gloss? That sounds delightful I think I would start my “exploring” the rest of the line with this! The sugar lemon line by fresh is awesome — I love using the sugar lemon eau de toilette in the summer months. It smells so crisp, clean and (duh) fresh! You should get to Sephora and sample it! I too, suffer from headaches and get nauseous when it comes to strong smelly perfumes so thanks for posting about this citron perfume. Citrus scents are my choice for fragrances! I just got the Fresh Strawberry Wild Flowers perfume from Sephora last weekend. Honestly, I was drawn to the darling box with little strawberries on it, and the scent was alright too! Doesn’t smell like strawberries, but it does have a very crisp fresh smell, like citrus and wild flowers. And it isn’t very strong–I spray a whole bunch and can barely smell it. I have the same problem with strong fragrances causing headaches, so this one is definitely a winner! I have some fresh perfume (sake) that I loooove, and it’s just about the only fresh product I can afford. I got hooked on samples at the Sephora on the promenade in Santa Monica and when they ran out I was devastated. But it’s too rich for my blood. I LOVE that scent! I too am almost out and am bummed. I love their perfumes, I don’t like strong perfumes either and also don’t think that wearing something really strong to teach elementary school is a good idea :) You can go to Sephora and they’ll give you a sample of any of the perfumes that they have so you could get a little one of this scent and try another one!